Grab the kids and your seasonal spirit, because it’s time to find your perfect pumpkin for Halloween 2018. 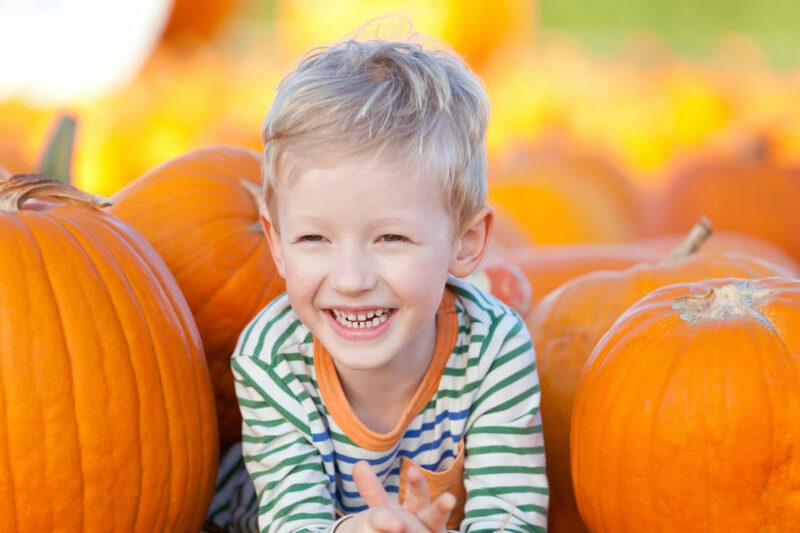 We have scoured the Lower Mainland for the best places to turn your pumpkin hunt into family fun. And more than just pumpkins, many of these locations offer large varieties of other seasonal items, such as corn stalks, gourds, and hay bales. Read on to find a perfect pumpkin patch near you. With a library, giant straw pile, farm animals, a fireplace, and an apple orchard to explore, there is no shortage of farm fun to be had at Southlands. The pumpkins here have already been harvested to make it as easy as possible for you, but are placed in their beautiful field for the thrill of the hunt. You and yours can even join in daily farm chores to learn about what it takes to run a farm. Southlands Farm is open from 9am until 5pm every day until the end of October. Visit the farm website for more information. Be sure to visit their Snow White Pumpkin Patch, Cinderella Pumpkin Patch, and the Classic Pumpkin Patch. You and your family can enjoy a family breakfast, petting zoo, hay wagon rides, and some of the best corn mazes you’ll find anywhere. There are plenty of other activities too, that will make this a visit you and your kids won’t forget. With so much to offer, the hours and details are too much to repeat here. So, be sure to visit their website and choose your family adventure at Maan Farms. This patch is open daily during the month of October from 12pm until 5pm on weekdays and 9am until 5pm on weekends. Admission costs $8 per person but $25 for a family of four. For more details, see Petey’s website. The Chilliwack Corn Maze has been a Lower Mainland favourite fall venue for years. With their impressive 12 acre corn maze, indoor hay bale maze, giant jumping pillow, pedal carts, duck races, corn train, petting zoo, tire mountain, fire pit, and more, there is absolutely no shortage of activities. The pumpkin patch features over 15 varieties of pumpkins so you can surely find the perfect one – or three. Open until the end of October, admission costs are $12.50 per person. Visit the Chilliwack Corn Maze website for hours of operation and more information. The patch offers carving pumpkins ranging in size from grapefruit to some over a hundred pounds. There’s a colourful assortment of pumpkin types ranging from Baby Boos to Big Max and there is also great variation in pumpkin colour including white, grey, orange, red and variegated. To help with your Halloween or harvest fest celebrations they also have ornamental gourds, cornstalks, miniature and full-sized hay bales and sweet sugar pumpkins for baking or cooking. Come and see Ladner’s Halloween Headquarters and their annual display of “scarecrows” incorporating pumpkins, gourds, other farm products, implements and good old country humour. For more information, visit the West Island Herb Farm website. For a more animal-filled pumpkin search, check out Eagle Acres Dairy Farm. It’s full of friendly creatures like rabbits, goats, cows, and kittens who love to say hi and cuddle. Eagle Acres is proud to offer hayrides to the pumpkin patch or you can stroll out to a closer patch beside the cows and pick your own. Included in your admission is a self guided tour of the dairy barn complete with themed displays. You can also venture around and visit a wide variety of other common farm animals both inside the barns or outside in pens. Eagle Acres is open daily except Mondays until the end of the month. Visit their website for more information. Tractor pulled Hay Rides, Indoor Hay Maze, Outdoor Cedar Maze, Outdoor Play Center, Pumpkin Displays, Gift Store, Goat Palace, Pig Hut, Chicken Coop, Haunted House, Face Painting, Face Boards, Pumpkin Cafe, Indoor Ball Toss, and Indoor Sand Pit. Admission Cost is free, although there is a $5 charge for those who would like to include unlimited hay wagon rides in their visit that day. All the other activities are still free of charge. Visit the Port Kells website for more information. Hay wagon rides go from 10am-6pm on weekends, holidays and professional days, and 3pm-6pm on weekdays throughout October. Visit their website for more information.